For other uses, see Concert (disambiguation). "Recital" redirects here. For other uses, see Recital (disambiguation). A concert is a live music performance in front of an audience. The performance may be by a single musician, sometimes then called a recital, or by a musical ensemble, such as an orchestra, choir, or band. Concerts are held in a wide variety and size of settings, from private houses and small nightclubs, dedicated concert halls, arenas and parks to large multipurpose buildings, and even sports stadiums. 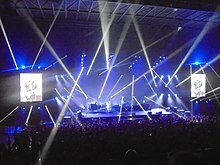 Indoor concerts held in the largest venues are sometimes called arena concerts or amphitheatre concerts. Informal names for a concert include show and gig. Regardless of the venue, musicians usually perform on a stage. Concerts often require live event support with professional audio equipment. Before recorded music, concerts provided the main opportunity to hear musicians play. While the first concerts didn’t officially appear until the late 17th century, similar gatherings had been around throughout the 17th century at several European universities, such as Oxford and Cambridge. Officially, though, the first public concerts that required an admission were created by the English violinist, John Banister. Over the next few centuries, concerts began to gain larger audiences, and classical symphonies were very popular. Finally, after World War 2, these events changed into the modern concerts that take place today. An example of an early, post-WW2 concert is the Moondog Coronation Ball. As stated in the general history part above, the first known occurrence of concerts where people are charged admission took place at violinist John Banister's home in Whitefriars, London in 1672. 6 years later in 1678, a man by the name of Thomas Britton held weekly concerts in Clerkenwell. However, these concerts were different. Before, you had an admission that you paid upon entering the building where the concert was held but at Britton's concerts, patrons purchased a yearly subscription to come to the concerts. At 10 shillings a year, people could see as many concerts they wanted to. In addition to holding concerts at certain venues, concerts also went to the people. In 17th century France, concerts were performed in the homes of the nobility, for only the nobility. Organized by Anne Danican Philidor, the first public concerts in France, and arguably the world, were the Concerts Spirituels. These concerts were held on religious holidays when the Opera was closed and served as a model for concert societies all over the world. In the late 18th century, music from the likes of Haydn and Mozart was brought and performed in English concerts. One notable work from Haydn performed at these concerts was his set of 12 symphonies, also referred to as the London Symphonies. Concerts reflecting the elegance of England during the time period were held at the gardens of Vauxhall, Ranelagh, and Marylebone. The musical repertoire performed at these events ranged from works composed by young Mozart, to songs that were popular in that time period. A recital is a concert by a soloist or small group which follows a program. It can highlight a single performer, sometimes accompanied by piano, or a performance of the works of a single composer, or a single instrument (organ recital). The invention of the solo piano recital has been attributed to Franz Liszt. Also, a recital may have many participants, as for a dance recital. A dance recital is a presentation of choreographed moves for an audience, usually in an established performing arts venue, possibly competitively. Some dance recitals are seasonal. Some performers or groups put on very elaborate and expensive shows. To create a memorable and exciting atmosphere and increase the spectacle, performers frequently include additional entertainment devices. These can include elaborate stage lighting, electronic imagery via (IMAG) system and/or pre-recorded video, inflatable sets, artwork or other set pieces, various special effects such as theatrical smoke and fog and pyrotechnics, and unusual costumes or wardrobe. Some singers, especially popular music, augment concert sound with pre-recorded accompaniment, back-up dancers, and even broadcast vocal tracks of the singer's own voice. Activities during these concerts can include dancing, sing-alongs, and moshing. Performers known for including these elements in their performances include: Pink Floyd, The Flaming Lips, Cher, Prince, Alice Cooper, Iron Maiden, Daft Punk, Lady Gaga, Jean Michel Jarre, Sarah Brightman, KISS, Gwar, Slipknot, and Madonna. Classical concerts embody two different styles of classical music — orchestral and choral. They are performed by a plethora of different groups in concert halls or other performing art venues. For orchestra, depending on the number of performers and the instruments used, concerts include chamber music, chamber orchestra, or symphony orchestra. Chamber orchestra is a small-scale orchestra containing between ten to forty members, mostly string instruments, and likely led by a conductor. Symphony orchestra, on the other hand, is a large-scale orchestra that can have up to eighty or more members, which is led by a conductor and is performed with instruments such as strings, woodwinds, brass instruments, and percussion. For choral style pieces, concerts include Choral music, Opera, and musical theater. Each encompassing a variety of singers who are organized by a conductor or director. There are a wide variety of concert venues that can range in size, location, and the type of music that is hosted at that particular venue. A concert hall is a concert venue which hosts mainly classical music such as a symphony, and they are often a part of a larger performing arts center. One of the most famous concert halls is Royal Albert Hall located in the United Kingdom. This venue hosts a wide variety of genres of music from classical concerts to pop concerts. An amphitheater is an uncovered circular or oval-shaped venue with tiers of seats surrounding the stage. Amphitheaters such as the well-known Red Rocks Amphitheatre, located in Colorado, hosts mainly rock and pop concerts. Rock and pop concerts, however, are mainly held in sports stadiums and arenas such as Madison Square Garden because of the tendency for these stadiums to have a larger capacity. A concert tour is a series of concerts by an artist or group of artists in different cities, countries or locations. Often concert tours are named, to differentiate different tours by the same artist and associate a specific tour with a particular album or product (for example Ariana Grande: Dangerous Woman Tour). Especially in the popular music world, such tours can become large-scale enterprises that last for several months or even years, are seen by hundreds of thousands or millions of people, and bring in millions of dollars (or the equivalent) in ticket revenues. A concert residency or musical residency is a series of live music concerts similar to a concert tour, but only performed at one location. While admission to some concerts is free, it is common practice to charge money for concerts by selling admission tickets. Before the advent of recorded-music sales and mechanical royalties in the early 20th century, concerts were the primary source of revenue for musicians. Revenue from ticket sales typically goes to the performing artists, producers, venue, organizers and the brokers. In the case of benefit concerts, a portion of profits often go towards a charitable organization. Additional revenue is also often raised through in-concert advertising, from free local concerts for local sponsorships to sponsorships from corporations during major tours e.g. 2009's "Vans' Warped Tour Presented by AT&T". Both Vans and AT&T would have paid significant amounts to have their company names included at the forefront in all marketing material for the Warped Tour. Concessions and merchandise are also often sold during and after concerts; often by the venue in the case of the former, and by the performing band or artist in the case of the latter. As of 2017[update], Italian singer Vasco Rossi holds the record for the biggest attendance of a ticketed concert with a total of 220,000 tickets sold for his show at Enzo Ferrari Park, Modena, Italy on 1 July 2017. The record was previously held by Paul McCartney's 1990 concert with a paying audience of 185,000 in Maracanã Stadium, Rio de Janeiro. Rod Stewart also holds the record for the biggest attendance in a free concert, with an estimated audience of 3.5 million during his 1994 New Year's Eve concert in Copacabana Beach, Rio de Janeiro. ^ "John Banister | English musician". Encyclopedia Britannica. Retrieved 2019-03-27. ^ "Concert | music". Encyclopedia Britannica. Retrieved 2019-03-20. ^ "How Franz Liszt Became The World's First Rock Star". October 22, 2011. Retrieved 17 January 2014. ^ Gaur, Aakanksha (2015-04-28). "Orchestra". Interlude.hk. Retrieved 2019-03-21. ^ "Kinds of Concerts: How To Enjoy A Live Concert". www.naxos.com. Retrieved 2019-03-20. ^ [www.aimm.edu/blog/top-10-music-venues-in-united-states. "Top 10 Music Venues in the United States"] Check |url= value (help). Atlanta Institute of Music and Media. Retrieved 2019-03-20. ^ McIntyre, Hugh. "Forget Vegas, New York City Has Become The New Go-To City For Concert Residencies". forbes.com. Retrieved 4 December 2017. ^ "Las Vegas Residencies: Here's Your Guide to Summer 2017". ew.com. Retrieved 4 December 2017. ^ "Vasco Rossi, Modena Park da record mondiale: 220.000 paganti". vh1.it. 24 May 2017. Retrieved 4 December 2017. ^ Gottfried, Gideon (29 June 2017). "Rossi Sets Record In Italy". Pollstar. Retrieved 9 December 2017. ^ "Arts and Media/Music Feats & Facts/Solo Rock Show Crowd". 25 May 2006. Archived from the original on 25 May 2006. Retrieved 9 December 2017. ^ "Arts and Media/Music Feats & Facts/Huge Free Gig". 25 May 2006. Archived from the original on 25 May 2006. Retrieved 14 December 2017. Hartman, Mitchell (August 31, 2015). "I've Always Wondered: 'The Travellin' Band'". Marketplace. Retrieved September 1, 2015. A piece on the economics of touring.